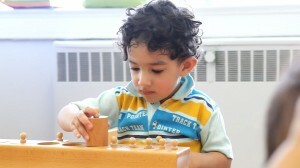 100 years ago Dr Maria Montessori has designed the long lasting and experiential Montessori program, where each child is taught individually, is allowed to choose, and is able to focus for an extensive period of time uninterrupted. In a VINCI School program, this same concept of enabling concentration is kept, and implemented in every lesson plan regardless it’s digital or tactile. Giving students choices is a huge part of the program. Allowing them to express themselves daily, rather than just listening to teachers, is another success ingredient that empowers students to be motivated and self-driven. At a VINCI School, besides traditional Montessori teaching materials which focuses on logic reasoning and language development, a series of Reggio Emilia style learning centers comes to compliment Montessori learning, for encouraging team work and communication among students. Can you imagine how much fun a child has by dipping her hands into a jar of shaving cream? With the teacher’s guidance, this fun experience can demonstrate to the child a lot of concepts, such as liquid/solid, flotation, volume and measurement. VINCI School's blended learning centers are designed such thatchildren can have fun playing, creating, imagining, and learning, by combining digital game-based lessons with typical classroom learning centers such as kitchen or water. VINCI digital apps inform children about the concepts behind each learning center, according to specific age groups, offering a true blended, fun learning experience. Below is an example of a VINCI School learning center – Kitchen. Children play on either tablets or their class smartboard to learn about various food categories, gaining vocabulary and learning how to count during the process. In conjunction with game-based lessons, children play with toy food items or to pretend to play with a toy or real kitchen set. A lesson plan is provided to teachers as a reference in order to keep children on track. Copyright © 2018 VINCIEdu.org. All Rights Reserved.